Robinson points out that every education system on Earth has the same hierarchy of subjects. At the top are mathematics and languages, then the humanities, and at the bottom are the arts. As he puts it “what happens is, as children grow up, we start to educate them progressively from the waist up. And then we focus on their heads. And slightly to one side”. 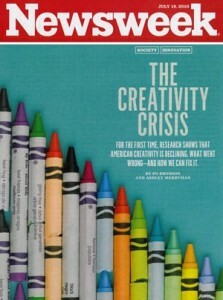 Newsweek’s 2010 article ‘The Creativity Crisis‘ became an international sensation in it’s report that creativity scores in America are declining. 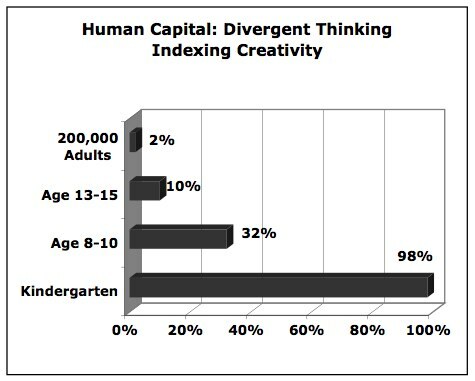 The article states that unlike IQ where with each generation scores go up about 10 points, creativity is showing a reverse trend: American creativity scores are falling. Kyung Hee Kim discovered this after analyzing almost 300,000 Torrance scores of children and adults. Kim found creativity scores were steadily rising, just like IQ scores, until 1990, with the most serious decline being in young children – from kindergarten through sixth grade. At the time this article was written in 2010 the authors stated: “there’s no concerted effort to nurture the creativity of all children”. Sadly this is still largely true today and an increasing concern due to the rise of standardized testing. 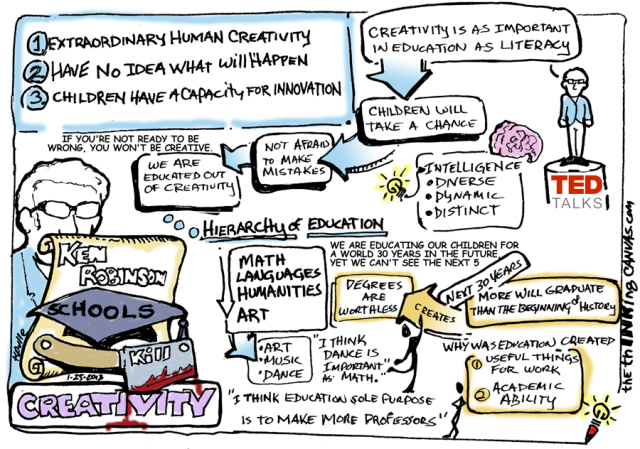 Schools around the world, however, are making creativity development a national priority. For example, Finland has long been known to be among the top education system measured by students consistently testing at the top of international tests (PISA) and reported as being happy, less frequently tested and having more time for play. The latest new development is what Finns call “phenomenon” teaching – or teaching by topic rather than subject areas. Ms Irmeli Halinen, Head of curriculum development with Finnish National Board of Education discusses the basic education curriculum reform in Finland in this video. She says: “We need to think about how our schools are functioning… School must be a change force itself – “in education we build the future”. These three points, I believe are the key ingredients to a positive creative learning environment. Teaching creativity in classrooms is a hot topic. Educators and administrators largely see the value of creativity in our times of change and uncertainty and efforts to teach creatively and teach for creativity are emerging daily. According to the University of Toronto: “Emergent curriculum is based on the premise that children are most successful at learning when curriculum experiences account for their interests, strengths, needs, and lived realities.” These programs prioritize and promote inquiry, curiosity, flexibility and adaptable methods, play-based learning and relationship building. To plan an emergent curriculum requires observation, documentation and creative brainstorming and flexibility by the teacher. That practice in and of itself models and demonstrates creativity to students. According to Forest Schools Canada: “Inquiry places students’ questions and ideas, rather than solely those of the teacher, at the centre of the learning experience.” In practice, students learn to test hypotheses, collaborate with peers, working within a respectful, non-judgemental, safe community. They are allowed to make mistakes, learn by doing and explore, experience and solve problems and conflicts. In particular, a notable trend in inquiry based learning environments is ‘Building Children’s Understanding of the World through Environmental Inquiry‘. Creativity specific programs are not necessarily new (both CORT Thinking by de Bono and Future Problem Solving Program founded by Torrance started in the 1970s) however many additional programs have been started in recent years and momentum is picking up! While not necessarily integrated into educational systems directly, these programs provided extra-curricular education on creativity process and skills with group challenges to practice problem solving and critical thinking. With the mission “develop the ability of young people globally to design and promote positive futures through problem solving using critical and creative thinking” Future Problem Solving Program International (FPSPI) was founded in 1974 by creativity pioneer, Dr. E. Paul Torrance to engage students to develop a vision for the future and prepare students for leadership roles. Another international education program, Odyssey of the Mind provides creative problem solving opportunities for students from Kindergarten through college. In teams, members apply their creativity to solve problems ranging from mechanical devices to interpretation of literary classics and bring their solutions to competitions on the local, state and World level. The Destination Imagination program is a fun, hands-on system of learning that fosters students’ creativity, courage and curiosity through open-ended academic Challenges in the fields of STEM (science, technology, engineering and mathematics), fine art and service learning. Highly advanced learning systems have been in development for decades and are starting to make advances due to technology allowing for customizability and accessibility to resources and information. Examples include the Renzulli System and SOI Systems. Preparing students for 21st century success by creating opportunities to apply, deepen and stimulate learning through tasks. Think, learn, evaluate and create. Teachers use profile results to create tailored assignments and learning opportunities to think differently. Online learning solution to empower teachers and inspire students. “SOI” stands for Structure of Intellect” – a theory of the functions and products of human intelligence. It is a system of tests and training materials to develop intellectual learning abilities. Based on the work of J.P. Guilford and the continued research of human intelligence in education by Dr. Mary Meeker, the SOI paradigm rescues students from failure. Personalize learning resources continue to grow. Educational resources like Khan Academy have been revolutionizing the way students learn through personalized learning dashboards that “empower learners to study at their own pace in and outside of the classroom”. New online courses for creativity training continue to emerge. Burnett, C., & Figliotti, J. (2015). Weaving creativity into every strand of your curriculum. Buffalo, NY: ICSC Press. Weaving Creativity into Every Strand of Your Curriculum answers the question HOW? How can you foster creativity in your classroom? This book provides ways you can deliberately incorporate creative thinking skills into every one of your lessons seamlessly without taking away from the lessons themselves. Creative problem solving process and tools are essential skills for facing challenges. Equipping students to solve problems is the goal of this workshop. Children will learn ways to work together to diverge and converge, develop their thinking skills to formulate challenges, explore ideas, formulate solutions and formulate a plan. This workshop shifts mindsets and may spark new thinking like you’ve never seen before!